Food is Not the Problem: Deal with What Is! Home → Self Help Products and Packages → Food is Not the Problem: Deal with What Is! This book will help you quickly and easily understand why you’ve been so stuck with food and, most importantly, it will show you exactly what to do to change things for good! Preview the Table of Contents and Intro and Chapter 1 of Food is not the Problem: Deal With What Is! If you’re sick and tired of dealing with the insecurity and stress of your relationship with food, ‘Food is Not the Problem: Deal With What Is! will show you exactly how to break free from emotional overeating and eating disorders for good – (they all stem from the same place, it doesn’t matter how you relate to food the underlying triggers are the same). If you’ve spent what seems like your entire life dieting, losing and then gaining back all the weight you lost. If you eat healthy during the day, saving your cheating for the nights and weekends. If you’ve been hiding food and sneaking food when no one else can see you. If you deal with stress by using food to cope. If all of your relationships revolve around your issues with food. 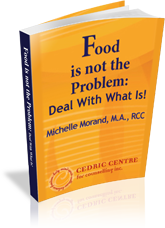 In this groundbreaking book, Michelle Morand, Founder and Director of The CEDRIC Centre, gives readers a solid road map to recovery from their use of food as a coping strategy. “Food is not the Problem” is filled with insights and tools that cover the three key areas of recovery: Your relationship with food; Your relationship with yourself; and Your relationship with others. Based on her own recovery experience from compulsive overeating and her 15 years as a specialist with her own counselling centre supporting hundreds of men and women worldwide to heal their relationship with food, this book is a comprehensive manual that outlines the path to recovery for anyone who uses struggles with food and body image. Whether you restrict, overeat, purge or a little of everything, “Food is not the Problem” will help you to understand why you do what you do and most importantly, how to stop once and for all. A life free from food and body image focus is within your grasp. You can free yourself from your stressful relationship with food. Years of dieting and the cycle of short term success and ultimate “failure” that the diet mentality brings, also known as the diet-binge-guilt cycle, may have led you to a place of hopelessness and despair about ever having a natural and free relationship with food or of ever feeling truly satisfied with your body. You may doubt that it is possible to truly feel that you are the best you can be. That sense of hopelessness and despair can make it hard to risk and try something new. It may be hard to believe that you can achieve a life where food is just food and you feel free and peaceful about it. It may even be hard for you right now to see that food is just a coping strategy and not the real problem. Many of the CEDRIC Centre’s clients remark “I can’t believe it’s this easy!” when they begin to see change in their relationship with food. It’s almost unbelievable how easy a natural relationship with food is to create and maintain. It’s getting the old diet mentality out of the way that poses the biggest challenge. And to that end Morand has created a program that takes you step by step through cognitive and behavioural changes that will release you from the death grip of the diet mentality and lead you freedom. In this groundbreaking book, Michelle Morand, Founder and Director of The CEDRIC Centre, gives readers a solid road map to recovery from their use of food as a coping strategy. “Food is not the Problem” is filled with insights and tools.